The requirements for dental care and the time and cost pressure increase especially for smaller dental laboratories. Besides the quality of dental work, the focus has shifted increasingly to production costs. Both of these aspects have been successfully considered in dental specialist DATRON’s latest product developments. The brand new highly compact dental milling machine D1 pure and new dental materials (blanks for all indications) plus tools will be shown to a selected trade community on 2 February 2015 - even before the official product launch at IDS 2015 - in an unusual environment. To date, the actual look of the D1 is pure is still largely a mystery in the industry. 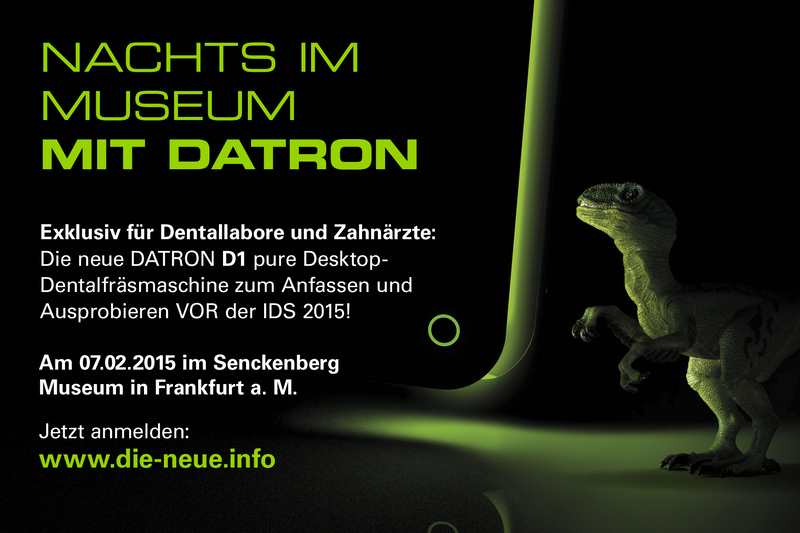 The Mühltal dental experts will solve the riddle during an exclusive night event at the Senckenberg Natural History Museum in Frankfurt a. M. The venerable halls of the Senckenberg will pulsate in DATRON Dental green light to top chart DJ beats. Dental laboratories and dentist practices with own laboratories from the entire German-speaking DACH region (incl. Austria and Switzerland) are invited to discover the many advantages of the new D1 pure dental milling machine engineered for machining soft materials. The evening is meant to be a relaxing sneak preview and networking platform. 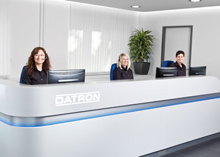 Participants have the opportunity to speak directly with DATRON’s dental experts and receive attractive special conditions on selected product packages (D1 pure, blanks etc.). According to the motto "People. Passion. Party.” the compact D1 pure touch will be flanked by drinks and snacks and DJ music with dancing amid the T-Rex and Triceratops exhibits. 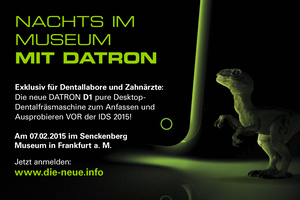 In addition, attendants can discover more of the Senckenberg during the guided tour "The teeth of time”. The party will go well into the night. For more information and to register for the event dental laboratories and dentists go to www.die-neue.info.